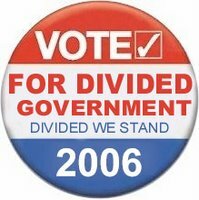 The Dividist Papers: Why does divided government work? Why does divided government work? More specifically - Why does divided government work to limit the growth of government spending? By exactly what specific mechanism does divided government accomplish this minor miracle? The answer: I don't have a f**king clue how or why it works. The point: I don't need to understand how or why it works to know that it does work to restrain spending. Just as I don't need to understand that two protons react to form deuterium plus a positron and a neutrino to create the energy from the sun, in order to know that if I don't wear some sunscreen at the beach, I am going to get burned. One is theory, the other is empirical experience. In scientific methodology, there is theory, and there is experimental/empirical evidence based on observation. Theories are proposed to explain the empirical evidence that experiments observe. Theories can be found to be right or wrong explaining the empirical evidence. But if the theory is shown to be false, it does not change the fact, that the empirical evidence is true. That divided government restrains spending is a historical, empirical fact, as documented by William Niskanen and others. We can act (vote) on that known fact. You can find similar arguments in the other comments on that post, or in the comments on my posts here and here. 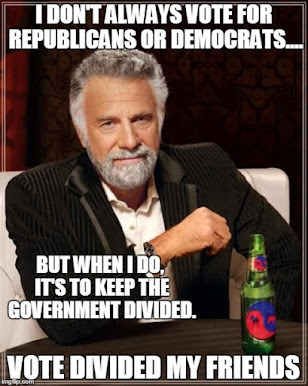 One more point: Divided government is not the same thing as gridlock. Gridlock can occur in both unified and divided governments. 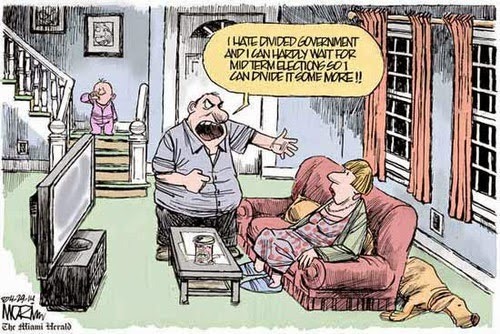 Divided government is a state that historically results in restrained growth of spending. 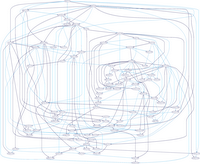 Gridlock is a theoretical mechanism about how that historical result happens. It is intuitive, it makes sense, and it might be true that that gridlock is the mechanism whereby divided government restrains spending, and it also might be true that it is something else entirely. It actually does not matter. Scholars write dissertations and books on the subject of divided government and how policy is developed under divided and unified governments in the United States. It is all very interesting, and there many conflicting theories to be found in this scholarship about why and how decisions are made. This linked site, highlights research applying statistical analysis and data mining techniques to the congressional voting record, all in the service of shedding some light on why congress does what it does. I have no doubt that somewhere in all of this scholarship, there is to be found a great theory which explains in detail why divided government has historically resulted in restrained spending growth. Personally, I subscribe to the "causal model of influence" theory illustrated by this "belief net" graphic based on the 2003 Senate voting record. Click on the graphic to review a full size version. Regardless whether you believe the theory that the sun's rays are generated from nuclear fusion, or whether you believe (as I do) that the sun's rays are generated by Apollo's flaming chariot as he makes his daily ride across the sky, you are still going to burn if you don't wear sunscreen. And regardless of whether a divided government restrains spending through gridlock, or whether it is a result of some other mechanism, we will all still be burned if we continue with single party control in Washington.